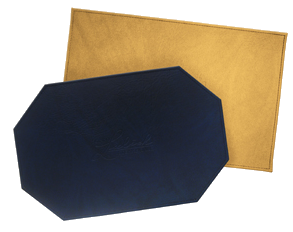 featuring a stiff hard-board interior & debossing for your logo, crest & name. • Restaurant Table Mats: enlarge to appreciate. 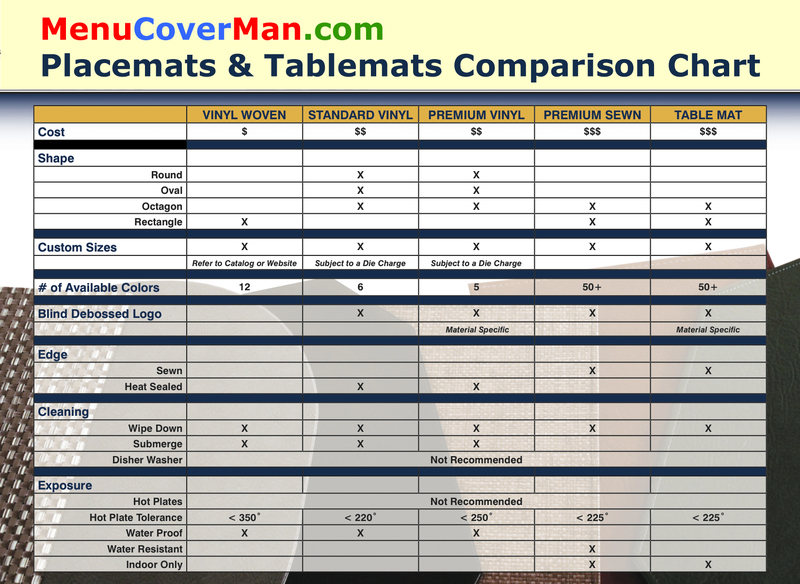 You'll see big Table Mat swatches, too! 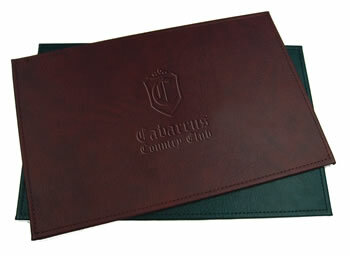 Country Club & Restaurant Table Mats coordinate with your club or restaurant decor, & add that distinguishing statement of impeccable taste & recognition. For the finest restaurants & club environments. Request a free sample. $12.50 S/H per sample. Beautiful debossing of your establishment's name & logo $85. See also Restaurant Place Mats. 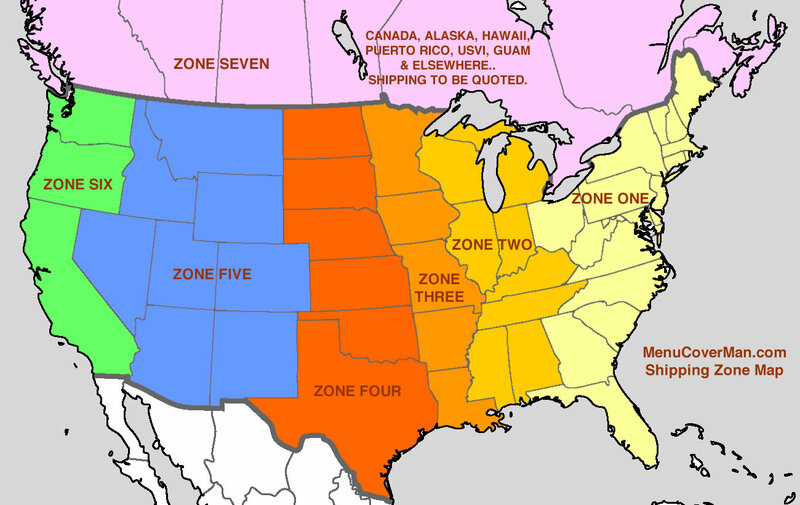 Click for shipping costs. IMPORTANT NOTE: Table Mats are water-resistant, and wipe clean with a damp cloth. They are NOT waterproof, and are not guaranteed against damage which is the result of weather or spillage. They are intended for elegant indoor environments where spillage is not a concern. If you require waterproof protection, then please consider All-Vinyl Placemats. Also, Table Mats have a stiff core; Placemats don't. 15" Wide x 11" High. 15" Wide x 13" High. 17" Wide x 11" High. 17" Wide x 13" High. 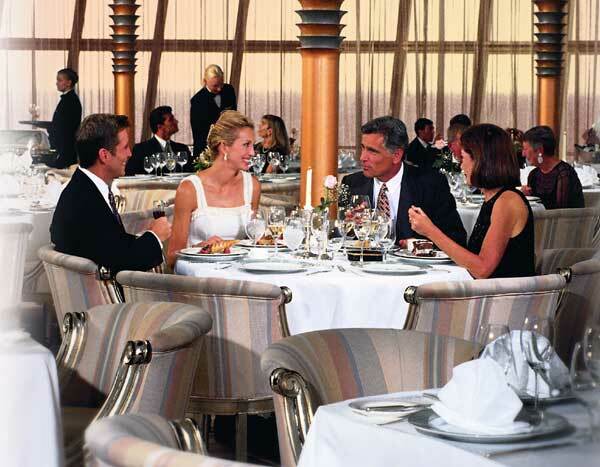 Yes, custom sizes for your new elegant restaurant table mats are quickly available. 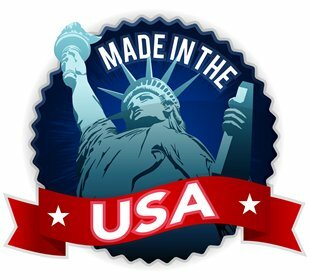 Call 888-777-4522 now in the USA & Canada & tell us what you have in mind. The rectangular table mat is shown for purposes of comparison only.